PC Magazine has an article on Evolution's new navigation & localization technology, NorthStar [also mentioned on engadget]. 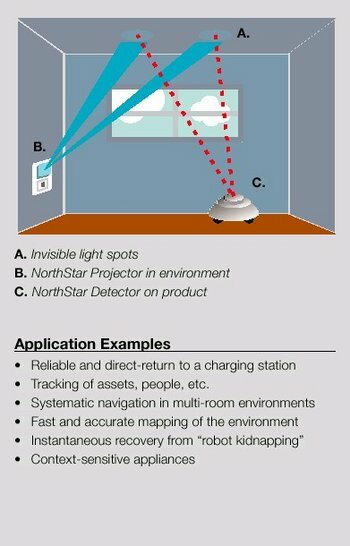 NorthStar allows a robot to determine its location within a few inches inside a room. It can also help a robot navigate from room to room, which is the scenario posited in the PC Mag article. Announced two weeks ago and demonstrated for the first time at the RoboNexus conference in Satan Clara, CA, the NorthStar infrared light projects two beams onto a ceiling up to 20 feet high. The sensor (which is built into the top of the robot) sees the lights and is able to figure out position information with regard to location inside the room as well as directional information, so it knows where it's going. Sensors can recognize more than one pair of lights. Each infrared light-emitting device includes a knob to change its ID. The sensor uses the ID to identify which room it's in. It's essentially a global positioning system for indoors (although GPS cannot tell you the direction you're heading in). Announced two weeks ago and demonstrated for the first time at the RoboNexus conference in ---Satan Clara, CA,--- the NorthStar infrared light projects two beams onto a ceiling up to 20 feet high.